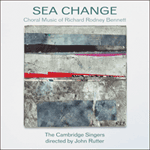 The opportunity to write for a virtuoso chamber choir called forth perhaps the most ambitious of Bennett’s unaccompanied choral works, one which explored new sound worlds to extraordinary and evocative effect. As well as a maritime theme, the texts all share a dreamlike quality of fantasy and illusion, Shakespeare’s Tempest texts fairly obviously so, Marvell’s and Spenser’s more obliquely. Marvell’s The Bermudas recounts the experience of a party of sailors shipwrecked in 1609 on Bermuda while en route from England to Virginia. Believed drowned, the sailors survived several months on the island and eventually continued on to Jamestown where their miraculous story caused widespread amazement, promptly inspiring Shakespeare’s The Tempest and later, Marvell’s poem. Spenser’s text, from Book II of The Faerie Queene, concerns the allegorical voyage (modelled on Odysseus’s) of the knight Guyon and the terrifying sea monsters he encounters during a storm. These four texts make for a satisfying musical whole. The cycle begins and ends in dreaming, conjured up with a distant bell, multi-divided voices and the use of strange ‘artificial’ scales which generate eerie bitonal harmonies. Bennett’s Full fathom five was, curiously, anticipated in these techniques by the aged Vaughan Williams in his similarly luminous and visionary setting of the same words in 1950. The inner movements offer sharp and effective contrasts. The Bermudas (Bennett’s second setting of this poem, unrelated to an earlier one for chorus and orchestra) is framed by haunting unaccompanied solos, for tenor and baritone respectively. Adjoining these are two hymn-like passages built on plain chords, sung by the thankful mariners, the first of them tranquil, the second more exalted; these in turn frame a flowing, melodious central section, marked Allegretto amabile, detailing the abundant bounties of the island. The shape of the whole movement is thus an arch-like ABCBA. The third movement, The waves come rolling, is the most startling—a kind of sprechgesang scherzo in which pitches are indicated as being approximate, and the composer directs that ‘the widest vocal and dynamic range is to be used and the maximum (melo)dramatic effect aimed for’. The mood is violent and nightmarish, and it was a dramatic masterstroke to follow this with the calm, timeless dreaming of Full fathom five. Safe from the storms’ and prelates’ rage. Unwitting what such horror strange did rear. Of huge sea monsters, such as living sense dismayed. Mighty Monoceroses, with immeasured tails. And greedy rosmarines with visages deforme. Compared to the creatures in the sea’s entrall. Hark, now I hear them, ding dong bell.